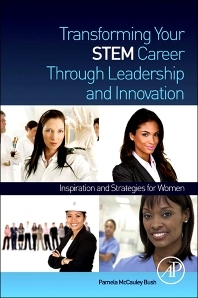 Women pursuing or involved in a career in the STEM fields who are interested in developing skills as leaders and innovators. This includes female students and academics as well as regulatory and industry professionals. Additional markets include academic and professional women’s organizations in these areas, as well as leadership development programs, innovation and technology conferences and professional development training and workshops. What Does It Mean To Develop Your Leadership Skills? Plan, Prepare – and Execute! Now that You’ve Done it! Pamela McCauley Bush, PhD, CPE is a leader, innovator and motivator. She is currently an Associate Professor and Director of the Ergonomics Laboratory, Industrial Engineering and Management Systems Department at the University of Central Florida. She is also the Chief Technology Officer of Bush Enterprises/Tech-Solutions, Inc. Dr. Bush is a successful researcher and innovator as demonstrated by the numerous federal research grants, technical publications, and national and international committee appointments to her credit. She is a nationally recognized motivational speaker in the Women’s Leaders and STEM Education communities.